This tutorial describes the reduction of pcaps to the very significant packets to answer a specific question. Did it happen to you that your pcap was in the Tbyte range and you had no clue what’s in it and loading it into Wireshark is already at 1GByte cumbersome. pcapd is older and extract packets into a new pcap according to flow indices in different operational modes of the Anteater. E.g. if T2 is in alarm mode pcaps are only extracted if an alarm in an internal signalling block globalWarn is set. If was designed for maximum flexibility to enable the user configure T2 into an intelligent flow based IDS. So mostly running on an interface. Forensic guys might have several pcaps, and always different questions, then pcapd has to be invoked every time if different flows have to be extracted. This is avoided by findexer. This plugin indexes all packets in the pcap. Whenever your question changes you can select flows and store them into a pcap without running T2 again, hence the drill down process is much faster. First I recommend to set T2 into a pristine state by removing all unnecessary or older plugins from the plugin folder ~/.tranalyzer/plugins and compile the standard plugins. Just as a precaution if you did not do any tutorials beforehand. pcapd and findexer were made for reduction of really large pcaps, but we cannot supply here TBytes for you. So download the sample pcap if did not do it already: faf-exercise.pcap. And imagine it is very very big. Or just use your own if you need something larger. Please extract it under your data folder. Sniffing directly from the interface is required, so have your sudo PW ready. Now you are all set for T2 monitoring experiments. In order to find interesting flows it is always good practise to look first at the end report and protocol statistics. The rest of the standard plugins also provide pertinent information in the end report. If PLUGIN_REPORT 1, which it is by default. Only IPv4 TCP flows. All symmetric, all bandwidth measure the same, so we have all the packets. Good. Not much traffic, average packet load indicates downloads, and who is responsible? Probably the biggest talker. Some retries, and the window size hit 0, not a major problem. The number of connections is not worrying, so no indication for bots or P2P, which should not happen in our network, right? Looking into the protoStats file reveal three well known ports FTP, SMTP and HTTP and one unassigned biggest talker. Lets assume ftp and http is unusual for our network, all is encrypted. So we like to learn more about ftpDecode and httpSniffer. The mail we ignore for now, the reader may look into that for himself, then he understands, why I left it out. So Applications, Images and text. Let’s look at some pictures. So there is HTTP 1.0, very odd for 2009, and we download an executable. Security guys should be interested now. And we have passive FTP around. In our network, no we only use SSH and SCP, why is that? If this file is very long, you might be interested to first reduce the pcap size. This is what we discuss in the following section. Extracting flow based information from the pcap to produce a downsized pcap can be achieved by the pcapd plugin. It functions in various modes, being configured in pcap.h. The constant PD_SPLIT controls the size of the resulting pcap files if the -W option is selected in the T2 command line. Not important here, so leave it at default setting. PD_MODE controls the basic mode of operation. The idea behind the first two modes (0 or 1) is to use awk to extract flows of interest and then the pcapd plugin to create a PCAP with all those flows. Those two modes require -e option in the T2 command line. The format of the file must be as follows: * 0 The first column must be the flow index, the rest is ignored * 1 Reads directly from flow file, so the second column must be the flow index Lines starting with %, #, a space or a tab are ignored, along with empty lines. Flows whose index appears in the -e file will be written to a file named PREFIX_PD_SUFFIX, where PREFIX is the value given to T2 in the -e option. Note that if `PD_EQ 0, then flows whose index does not appear in the file will be dumped. PD_MODE 2 activates a special alarm mode where any plugin can trigger pcapd to dump a flow. Will be discussed in the tutorial alarm mode. PD_MODE 3/4 are interface modes, working in conjunction with the -W option of T2. Not important here, will be discussed in a later tutorial to come. PD_MAX_FD controls the number of active file handles in mode 4. We leave everything at default, because we work now on a pcap and generated a flow index file: nudel. Hence, we need the -e option in the T2 command line later on. In order to accelerate the extraction process it is recommended to build pcapd under another directory, so that only this plugin can be loaded. Hence, if another question has to be applied to the pcap only the plugin folder can be selected by the -p option. Because pcapd is only needed temporary, it can be buiilt under /tmp. As you can see T2 produces a new pcap called nudel.pcap. Rerun T2 on the new pcap. Much less flows and packets. If you look at the resulting flow file, you actually see more flows than in our request on the original flow file above. Because not in every flow direction certain flags are set. So you also get the return or orig flow now, which preserves context of a communication and avoids unnecessary further tawk questions. As we run t2 with the -s option, there is also a packet file. Have a look into it and see what you find. Have fun. If you do not want to build an alarming tool for anomalies which extracts packets from on plugin request or if you have a stack of questions to a large pcap, and you do not want to rerun T2 all over again several times, the findexer plugin is the tool of choice. So remove pcapd from /tmp and compile findexer in your plugin repository and run T2. findexer produces a binary faf-exercise_flows.xer file, which contains all references between flow indexes and packets. Move to your results bash window or move to the results directory and do a ls then you spot it. Now invoke the tawk which selects the flows from the pcapd section and add the -x option to produce a pcap. and ls will show you the knoedel.pcap file. You may now run T2 on the knoedel.pcap and you will see only the selected flows as in the pcapd section. The main difference is that you can rerun the tawk above with a different question and you will get right away a new pcap without reinvoking T2. E.g. a troubleshooting question: Select all flows where the window size was reported to 0, so the receiver could not process more packets anymore. User the tcp Window size threshold ratio variable: $tcpWinSzThRt in tcpFlags, threshold is 0 by default. I leave this exercise to the reader. There are people who like to work with wireshark or tshark instead of t2 packet files. Fair enough, a bit more complicated if you have a lot of data. and log off and on again. 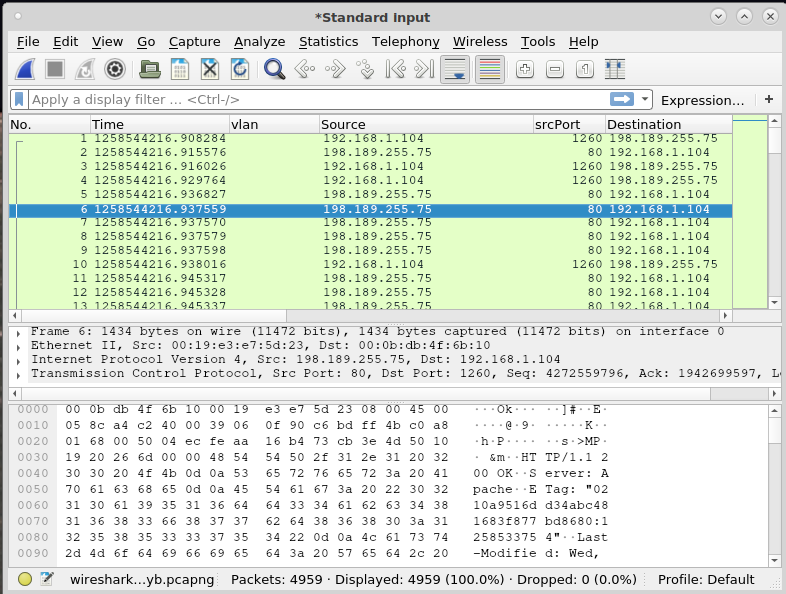 Then try the the tawk above again and you will have wireshark open with the knoedel.pcap. Very large pcaps produce large flow files, if you do not aggregate enought or if you have too many plugins. Right! There is a way to split these files. One way is to use the -W option in T2 which produces more smaller flow files instead of one large file. Split the input file into smaller more manageable files. - else keep fields specified in h, e.g., "srcIP,dstIP"
- s: a comma separated list of files to create (see `s`). yep all ftp. Does that help you? Give us feedback please. If somebody is interested why it is so easy to produce all kinds of functionality with tawk. There is a tool anael built, the fextractor which does all the work extracting packets according to any question, using the *.xer file. Imagine you have only a distinct selection of pcaps to analyze, and they are big, so that you do not want to run tranalyzer every time you change your question, or you select certain flows. And imagine you want to script everything yourselve without using tawk -k because you want to do your own thing. Fair enough, then the fextractor is your tool of choice. Note that tawk -k uses fextractor as well. Extract the flows FLOWINDEX using the _flows.xer INTPUT generated by Tranalyzer2 findexer plugin. to end. The extracted flows are written to the OUTPUT pcap. optionally be prefixed with a direction A or B, by default both directions are extracted. they are replaced by, respectively, first and last available XER files. OUTPUT "-" means that the PCAP is written to stdout. (flow index in 2nd tab-separated column), or have one flow index per line. FILE "-" means that flows are read from stdin. only the A or B direction is present in the flow file. The -r allows you to process any pcap which is indexed by findexer. If you have several files which are indexed, e.g. nudel1, nudel2, ... then use the colon notation. The -w option denotes the location and name where the extracted pcap should be written. The -i option denotes the flow index file. From our earlier experiment with pcapd above we still have our flow index file: nudel. So move to your results folder and invoke fextractor using the already generated findexer faf-exercise_flows.xer file. Now you may change the nudel file and reinvoke the same fextractor command without running T2 ever again, if you are only interested in the same pcap. Have fun experimenting.